Endorsed by Gov. Jay Inslee, a bill to phase out net-pen farming of Atlantic salmon in Washington has handily passed the state Senate and heads to the House. OLYMPIA — Slamming the risks of Atlantic salmon farming in Washington waters, Gov. Jay Inslee endorsed a bill phasing out the industry that later passed the state Senate Thursday by a wide margin. The legislation, approved on a vote of 35-12, would end Atlantic salmon net-pen farming in Washington as existing leases terminate by 2025. The bill now heads to the House. 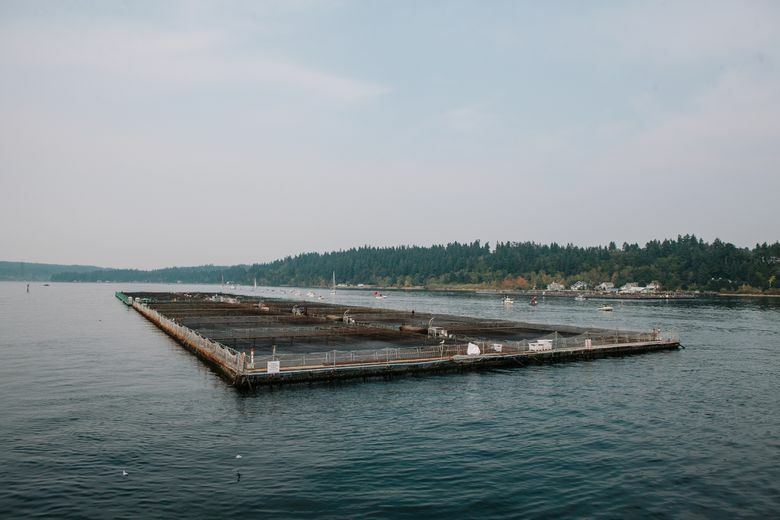 The governor called such farming “a risk that is intolerable.” Inslee faulted Cooke Aquaculture, the owner and operator of Atlantic salmon net-pen farms around Puget Sound, for “pronounced lack of responsibility” that led to the collapse of its Cypress Island farm last summer. The collapse was the fault of Cooke’s negligence, state agencies found, following a months-long investigation. Cooke also misled the public and state about the cause and scope of the escape, regulators found, with far more fish released to Washington waters than Cooke stated, and more than 200,000 still unaccounted for. The bill affects no other aquaculture practices. Inslee’s morning remarks proved a prelude for the debate in the Senate on SB 6086, in which supporters faulted Cooke and said wild salmon have to be protected. “Wild salmon are threatened,” said Sen. Kevin Ranker, D-Orcas Island, co-sponsor of the bill. “This is the sort of negligent behavior by this corporation that can’t go unchecked,” he said, quoting from state agency findings that Cooke allowed 110 tons of mussels and other sea life to grow on its nets at Cypress Island, causing the net pen to collapse. “More important, the day-in, day-out impacts on the magical, majestic Salish Sea cannot go unchecked,” Ranker said, telling his colleagues he is worried about the spread of disease and pollution from the pens. The company already has lost leases to operate five of its nine net pens because of enforcement by state Commissioner of Public Lands Hilary Franz. Cooke is fighting in court the termination of one of the leases, at Port Angeles, saying it is based on a misunderstanding. Tribes also have presented a unified front against the industry, with 21 tribal chairmen writing state lawmakers last month asking the industry be terminated as soon as possible because of the threat to wild salmon. A substitute bill supported by Cooke to require operators to switch to stocking only female fish after the leases run out was easily defeated, as was an amendment requiring more study instead of a phaseout of the industry. If it passes and is signed into law, the bill would eventually end an industry that has operated in the state since the 1980s. Cooke’s farms support fewer than 200 jobs in Washington, and the industry is small here compared with British Columbia, or with Cooke’s operations elsewhere. The company employs 5,000 people worldwide and is one of the largest Atlantic salmon farmers in North America. But for Cooke, based in New Brunswick, Canada, Washington is a coveted beachhead for expansion for a multinational corporation on the grow. Washington is today the only U.S. West Coast state that has the industry in its waters. Opponents of the bill said the concern about pollution seemed hypocritical, given the failure of King County’s West Point wastewater-treatment plant last winter, causing untreated sewage to spew into the Sound, and partially treated wastewater to be dumped into the Sound for months. Sen. Keith Wagoner, R-Sedro-Woolley, said the net-pen breach “was not an ecological disaster, but a loss for a legitimate business that employs people. Joel Richardson, vice president for public relations for Cooke Aquaculture, watched from the Senate gallery with other Cooke managers as the Senate debated the bill. He left before the vote was counted.